Mission Beach Condos located on the ground floor can sleep up to 18. Great location - cross street YORK - near all food, coffee, shopping. 180 degree views with a huge patio, BBQ, bike parking. 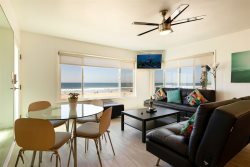 Two beach houses loaded with features including swing arm mounted high def PLASMA TVs, DVD, IHome sound system, under counter lighting, pendant lighting, Two GE Profile kitchens, built-in Washer & Dryers, and so much more! Watch the dolphins swim by each morning and afternoon, watch the amazing Mission Beach sunsets from your comfortable convertible Euro Loungers while watching your favorite TV show. Both kitchens are fully equipped to handle even a Thanksgiving dinner! The Calvin Klein sheets, towels & pillows come from a 5 star luxury hotel supplier. Every detail is attended to. We own 6 properties on the beach and bay and pride ourselves in offering 5 star service! Early and late check outs are available for a small fee - contact us!